Phantom is based on Hussain Zaidi's book "Mumbai Avengers" (Zaidi also wrote Black Friday, which was made into the movie of the same name) where a team of handpicked agents avenge 26/11 by killing terrorists responsible for the carnage. For the film, director Kabir Khan boils this team down to one agent, Daniyal Khan. As a result, Phantom tends to be the poor man's D-day, simplistic and inauthentic, despite some tension-filled moments. 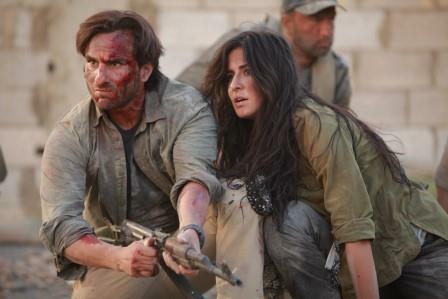 Saif Ali Khan plays Daniyal Khan, a dishonorably discharged Army officer looking to regain his honor. Khan's character is quite the super-agent, but he sails through the film on auto-pilot, nary a trace of emotion anywhere. Katrina Kaif plays Parsi Nawaz Mistry, who gets involved in Daniyal's mission because she has fond memories of the time spent with her late father on the Mumbai shoreline. As Mistry, she is wooden, which is not totally unexpected from her. The film starts off with a car chase in the US. We see Saif Ali Khan, on of the drivers, then jailed for manslaughter. As things become clearer we realize that Saif's character, under various guises is on a mission. The mission itself is the brainchild of earnest RAW agent Samit (Zeeshan Ayub). Much of the film is comprised of Daniel Khan traipsing all over the world tried to get rid of the baddies. Towards the end the action moves inside Pakistan. There are some genuinely interesting moments here as Nawaz and Daniyal work with other embedded RAW agents to achieve their goal. Truth be told, I didn't dislike Phantom. I am put off by its naivete, though. And comparisons with D-day are but natural. Where D-day had sophistication, depth, and attention to detail, Phantom feels superficial and cosmetic, like made by someone using only half his brain. There is a time post-interval, when the film starts to get a little stupid, but it recovers thankfully. I cannot quite feel for Nawaz and Daniyal, partly because Khan and Kaif perform poorly, and partly because the director doesn't build characters we can look up to or root for. We are told who they are and why they do what they do, but can't quite feel it for ourselves. While Phantom is interesting, and works in parts, it remains a film where the actors mainly go through their motions. It doesn't distinguish itself in any way. There are better films on the same subject, and Phantom pales in comparison.